Open Heaven [1 June 2018] What are you living for? 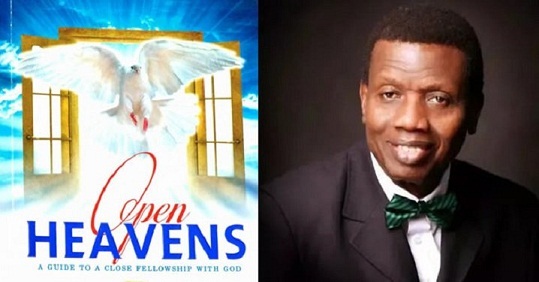 - Open Heavens Daily Devotional Messages, By Pastor E.A Adeboye. Open Heaven [1 June 2018] What are you living for? 5 Then called Esther for Hatach, one of the king's chamberlains, whom he had appointed to attend upon her, and gave him a commandment to Mordecai, to know what it was, and why it was. 6 So Hatach went forth to Mordecai unto the street of the city, which was before the king's gate. 7 And Mordecai told him of all that had happened unto him, and of the sum of the money that Haman had promised to pay to the king's treasuries for the Jews, to destroy them. 8 Also he gave him the copy of the writing of the decree that was given at Shushan to destroy them, to shew it unto Esther, and to declare it unto her, and to charge her that she should go in unto the king, to make supplication unto him, and to make request before him for her people. 9 And Hatach came and told Esther the words of Mordecai. 11 All the king's servants, and the people of the king's provinces, do know, that whosoever, whether man or women, shall come unto the king into the inner court, who is not called, there is one law of his to put him to death, except such to whom the king shall hold out the golden sceptre, that he may live: but I have not been called to come in unto the king these thirty days. 12 And they told to Mordecai Esther's words. 13 Then Mordecai commanded to answer Esther, Think not with thyself that thou shalt escape in the king's house, more than all the Jews. 14 For if thou altogether holdest thy peace at this time, then shall there enlargement and deliverance arise to the Jews from another place; but thou and thy father's house shall be destroyed: and who knoweth whether thou art come to the kingdom for such a time as this? 16 Go, gather together all the Jews that are present in Shushan, and fast ye for me, and neither eat nor drink three days, night or day: I also and my maidens will fast likewise; and so will I go in unto the king, which is not according to the law: and if I perish, I perish. Open Heaven 1 June 2018 What are you living for? The question today is: what are you living for? Esther 4:5-16 tells the story of a young lady who decided to live for God and His people. She was ready to die if only the will of God would be done in her life through it. Despite the fact she was a queen, she declared, “if I perish, I perish” (Esther 4:16). In a similar situation, the book of Daniel tells of how three Hebrews boys disobeyed the decree of King Nebuchadnezzar when he wanted to lead them into idolatry. Shedrach, Meshach and Abednego were killing to be thrown into the fiery furnace in order to obey their God (Daniel 3:16-18). Open Heaven 1 June 2018: [Friday] Daily Devotional By Pastor E. A. Adeboye – What are you living for? Some people live for the food they will eat, the clothes they will wear, the house they will live in and the car they will ride in, all at the expense of their soul. However, if you hearken diligently to the words of the Lord to seek Him and live for Him, everything else will follow. Father, help me to live completely for You from today in Jesus’ Name. Labels: Open Heaven 1 June 2018: [Friday] Daily Devotional By Pastor E. A. Adeboye – What are you living for?